MailChimp is an great extension to use for sending powerful email campaigns and blasts to your users, as well as setting up some automated email campaign rules so that your customers get a truly customized email experience. Orders, users, and products are synced to MailChimp for your use on setting up campaigns and useful for setting unique email experiences based on MailChimp system rules. A full installation and configuration of the MailChimp extension and API connection. 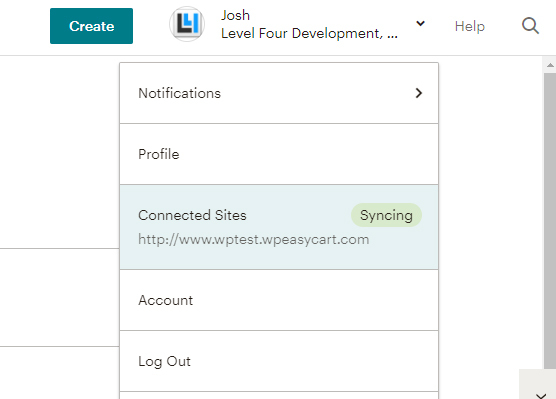 Connect with MailChimp and assign your MailChimp lists in the EasyCart. Sync your entire store (products, users, orders) with MailChimp so that you can begin collecting sales data in MailChimp. 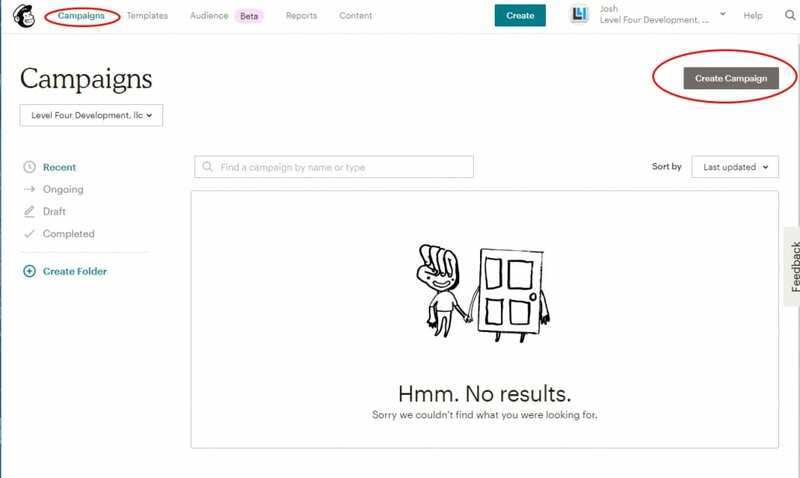 Now that you have synced products, users, orders, you can start creating automated campaigns based on previous orders, abandoned carts, or retarget purchasing users with MailChimp. 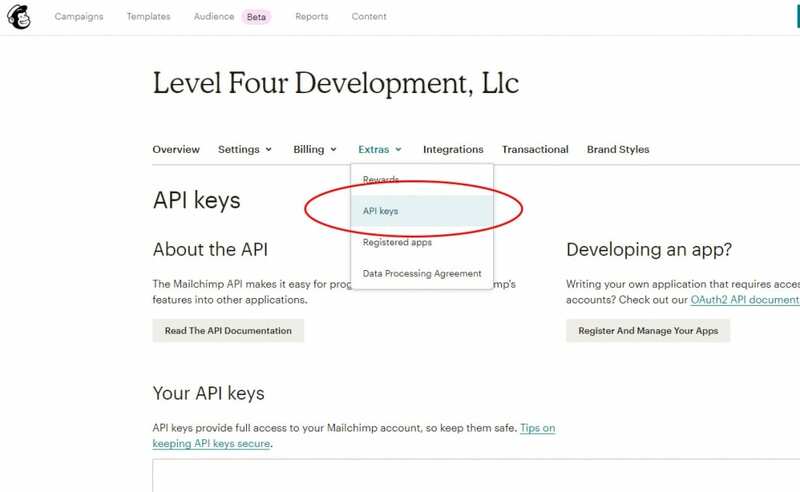 The first step in working with the mailchimp plugin is to connect it with an API key. To locate an API key in your MailChimp account, go to the ‘Account‘ menu in the top right corner. Here you will look under the ‘Extras‘ -> ‘API Keys’ section. Use this section to build an API key. Next, you will. go to your WP EasyCart Extensions -> MailChimp menu in your wordpress. The first thing we do here is paste our API key into the plugin and Save. Once we have saved our API key, we will need to connect to a subscriber list. MailChimp is a bit confusing here, but your main list can have multiple stores under it. You may think this is backwards, so did we, but go ahead and choose your business from the EasyCart Subscriber List section. MailChimp offers their eCommerce system, which allows you to connect a MailChimp store to your EasyCart store. This step is fairly simple, but now that we have the plugin installed, connected with the API system, you will ‘Create New Store‘ FROM EasyCart to MailChimp. When creating a new store in the EasyCart MailChimp plugin, you will be asked what list, give your store a unique name, and a unique default email address that your mail will come from… Something like ‘sales@mystore.com’ will work. Now that you have created a store, you should see this back on the main screen of your EasyCart MailChimp plugin. Be sure to save your settings along the way as you choose your store. You can also start to see that your store is connected over on MailChimp. You may look under your account menu and see it is connected and syncing. 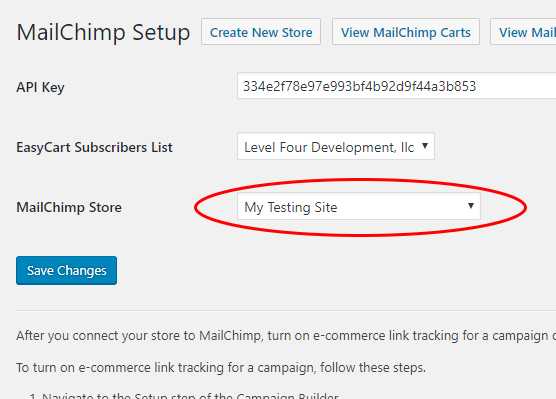 The first time you setup the MailChimp plugin, you will need to sync your store. 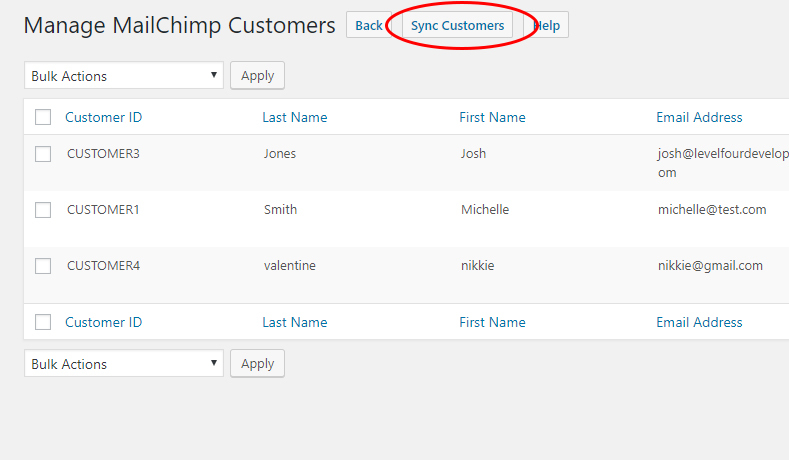 After the initial sync your store will automatically push data to MailChimp as users interact with your store. To start this process, go to your EasyCart MailChimp plugin and then click on ‘view MailChimp Products‘ and ‘Sync Products‘ to start this process. Notice you can even edit individual items here so that your mailchimp data is exactly how you want it… this would include custom descriptions, titles, pictures, etc. 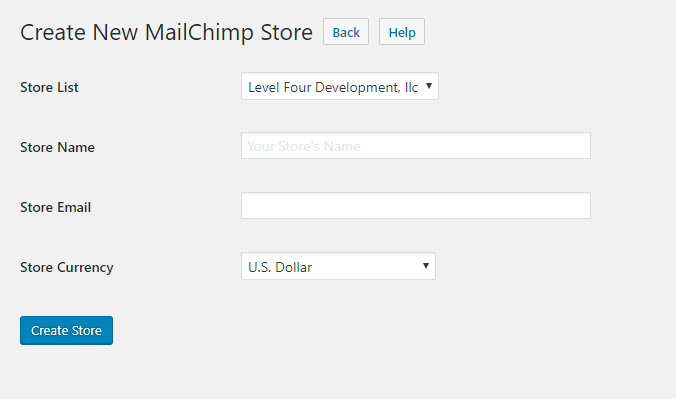 The first time you setup the MailChimp plugin, you will need to sync your store. After the initial sync your store will automatically push data to MailChimp as users interact with your store. To start this process, go to your EasyCart MailChimp plugin and then click on ‘view MailChimp Customers‘ and ‘Sync Customers‘ to start this process. Notice you can even edit individual items here so that your mailchimp data is exactly how you want it… this would include customer names, addresses, and order counts. 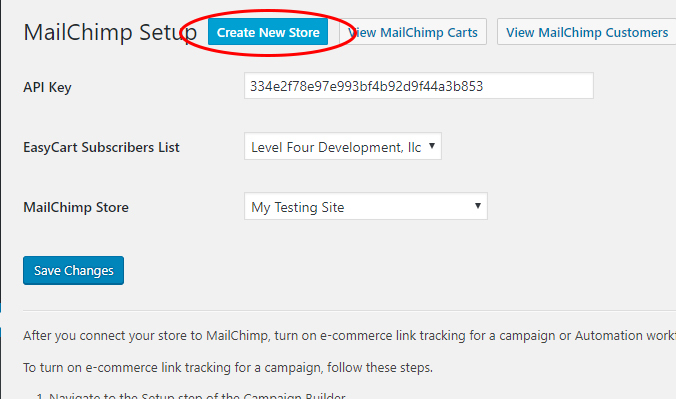 The first time you setup the MailChimp plugin, you will need to sync your store. After the initial sync your store will automatically push data to MailChimp as users interact with your store. 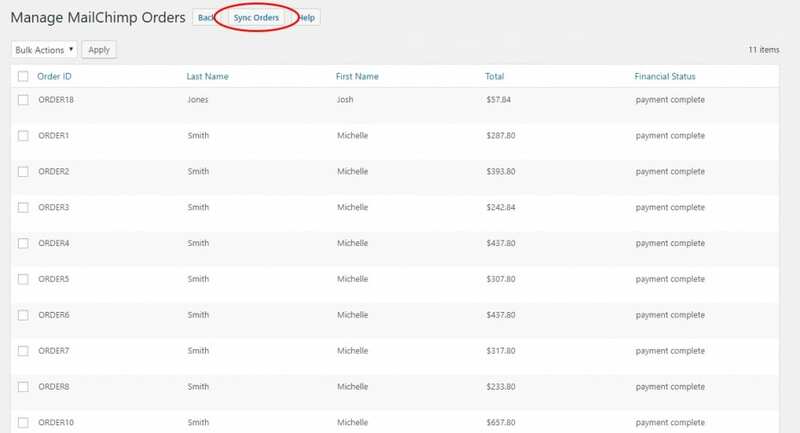 To start this process, go to your EasyCart MailChimp plugin and then click on ‘view MailChimp Orders‘ and ‘Sync Orders‘ to start this process. Notice you can even edit individual items here so that your mailchimp data is exactly how you want it… this would include customer names, addresses, and order counts. 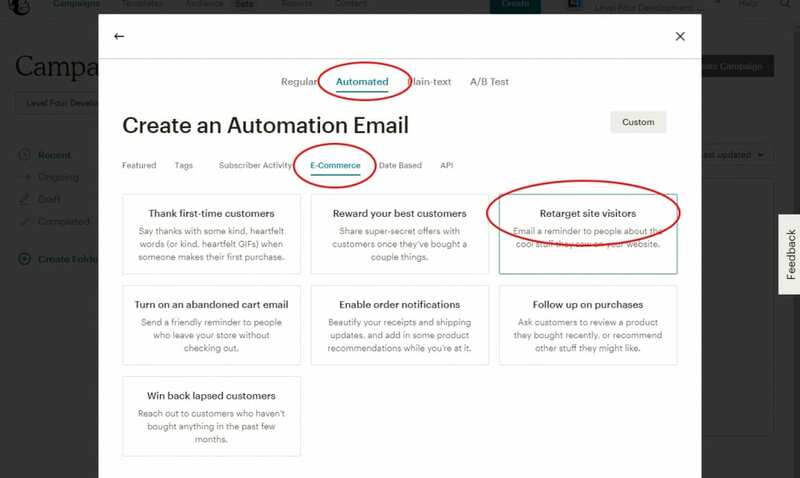 Now that you have a connected store, and you have synced products, customers, and orders… You can set up MailChimp automation. Simply go to your syncing store menu. Open the Connected Site that you want to work with and you will be able to start setting up abandoned cart autoresponders, as well as first time order autoresponders and other details. 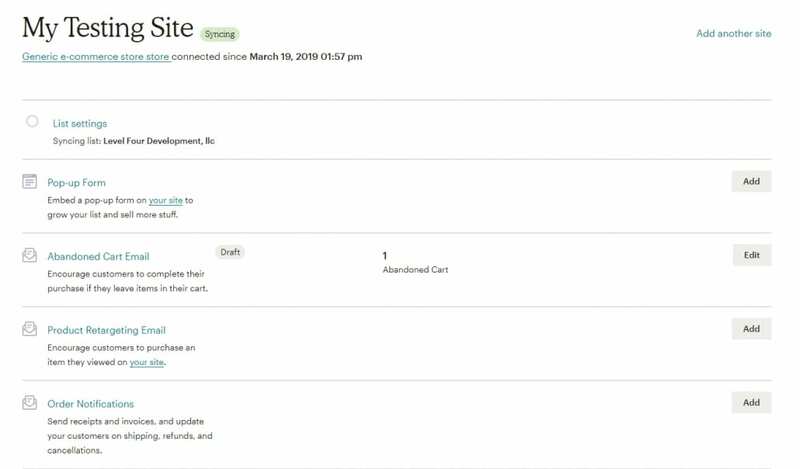 Notice in this example connected store we can set up abandoned cart emails, product retargeting emails, custom order notifications and more. All of the email setup at this point really is up to MailChimp and what you can do with their platform. For more information on how to work with MailChimp, we would refer you to them and their support staff. In this example abandoned cart email autoresponder, we setup after 24 hours to send an email from our email to the customer about whether they are still interested in our product…. All of your marketing choices are custom to your preferences and business at this point. Now that you have your store all connected and syncing, you can start creating very detailed emails based on the MailChimp system. 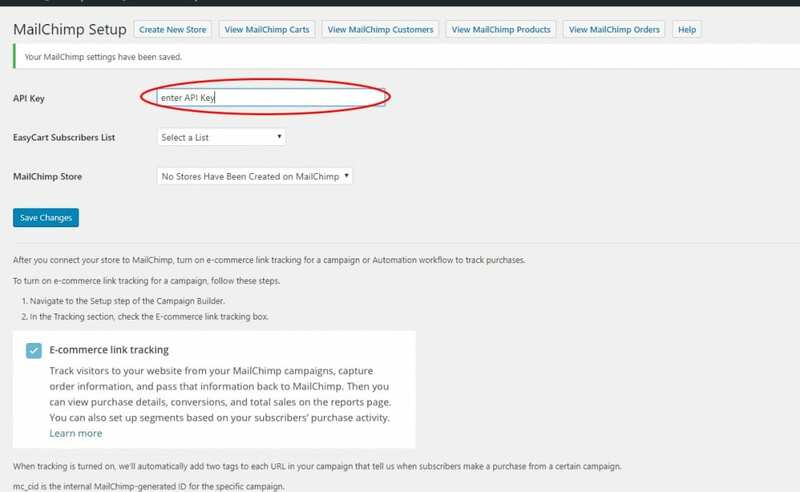 While these steps are not EasyCart built, they show you how the powerful MailChimp system lets you specify specific rules for your emails. Send out autoresponder emails after users purchase product XXXX or you can send follow emails to users and purchasers. The list is impressive, though sometimes hard to locate in their system. In this example notice we go to the ‘Campaigns’ menu and ‘Create a new Campaign’. This will launch their wizard and let you setup an Email with basic e-Commerce behavior. In this example we are doing an automated e-Commerce email that is going to retarget site visitors who have purchased a previous product. If you need more assistance from this point, we recommend discussing with MailChimp or viewing their documentation… but the options and customization are pretty impressive.